Seriously, was CL Rawal joking or something? He tags Deepak Kumar, the hero of his Aabroo, as the star discovery of that year. Deepak Kumar who? Never heard of him, never seen him in any film. And after watching this 1968 drama, I know why filmmakers never took a chance by casting him. He is excruciatingly bad as a performer. He has a wispy voice, a comical look on his face, his voice modulations are pathetic and every time he utters romantic nothings, I crack up! Actually come to think of it, he is almost like Mr Bean trying to do some serious Hindi film. Or rather Rowan Atkinson trying to sing, dance, act and cry in a true-Bollywood style. And yes, he is appallingly bad in all aspects!! Anand (Ashok Kumar) is a successful lawyer living in Kashmir with a doting wife, Tilottama (it's so pleasant to see Nirupa Roy play a happy role) and two lovely children. His younger brother, Manish (the ghastly Deepak Kumar) has just returned from abroad after becoming a doctor and is awaiting appointment in any good hospital. While serenading in the scintillating valleys of Kashmir he meets Neena (Vimmi), and instantly falls in love with her. Neena initially balks but cannot stay away from Manish's charms. Charms yeah!! Anand's faithful friend is Chandrashekar (Rehman) who has helped him monetarily in many cases. But Shekhar is large-hearted and does not want his money back. He has a lovely wife at home in Bombay, is blindly in love with her. However the couple does not have a child. And Sharda (Leela Naidu) is rather pained for not being able to fulfill the wishes of her mother-in-law (Lalita Pawar in one of her typical mum-in-law roles!) She pleads with Shekhar to get married again but Shekhar is too much in love with Sharda to acquiesce. So, the tension continues between Shekhar, his mother and Sharda. Meanwhile, Pawar's distant relatives, Darwajalal (Jeevan) and his accomplice Shanta (spicy Shashikala) enter the happy precincts of Shekhar's home and wreak havoc. Shanta poisons Sharda and on her deathbed she extracts a promise from Neena, who happens to be her sister and is visiting, that in her absence she will marry Shekhar. Neena is devastated because she has to part with Manish, but plays along the word given to her dying sister. She marries Shekhar but the man is never really able to acknowledge her as his wife since he still wholeheartedly loves Sharda. Manish has no clue about the marriage of his beloved and keeps waiting for her in Kashmir. But he is appointed as a doctor in City Hospital in Bombay and has to join soon. Anand instructs him to stay with Shekhar for the first few days as it will be a new place for him. Manish agrees, packs his bag and leaves for Bombay. When he arrives at Shekhar's mansion, his jaws drop to see Neena all dressed up as a married woman. Neena minces no words and informs him of her predicament and decision. She implores him to forgive and forget her but Manish in his signature soppy way tells her that he has been cheated by her and hence, can never forgive her. And forgetting her is beyond questioning. He prepares to leave the house when Shekhar arrives and intervenes. So now, Manish is forced to stay at the home where his ex-beloved is married to the his brother-figure. Considering the story is not that bad, the makers should really have taken care to cast more able performers as the lead pair. Deepak Kumar is incredibly bad and Vimmi is nothing great at all. In the midst, the talent of stalwarts like Ashok Kumar, Rehman, Lalita Pawar and Shashikala went wasted. Shashikala is seriously saucy and wicked. She schemes and poisons at every level. Lalita Pawar is the perfectly rude mother-in-law. Rehman is different as the sane and loving husband. Ashok Kumar is superb as the brother who has to sacrifice his filial obligations to do justice. Nirupa Roy's presence is like balm to any sad soul. She is charming and gracious. And the director gives her the onus of sorting things out in the end. And yes, the women wear some gorgeous clothes! I just watched the whole of Aabroo because I wanted to see what happens in the end. The songs by Sonik Omi were tolerable. The renditions by Mohd Rafi, Mukesh, Manna Dey and Asha Bhonsle were good. But, I cringed, gawked and got exasperated with this Deepak Kumar. The makers should not have gone all bonkers and called him the 'star-discovery of the year'. But there was one silver lining however. This Deepak Kumar is so superbly bad that in front of him the boring Vimmi also looks like she is acting!! >This Deepak Kumar is so superbly bad that in front of him the boring Vimmi also looks like she is acting!! I just watched a video clip of a song with Vimmi. I think the Mr Bean comparison hits the nail on the head. I watched this one last night. I really wanted to see some tear jerker. And I got my wishes. You said story is tolerable. Really?. Story is pathetic. Eight year old kind of writing. But all the golden oldies are great. I loved the scene just before the song - jinhe hum*** It was typical 1960s stuff. There was a competition between Vimi and Deepak Kumar about who can act worse. Deepak wins this one. Atleast Vimi looks good. Leela naidu was not given full chance to show her 'skills' otherwise she could have won the competition from these two stalwarts of bad acting. Hilarious line at the start "Find of the year" or some such thing. Really they couldnt have found somebody as bad as deepak kumar. Even Rajendra Kumar was a better action than this Deepak kumar. Interesting challenge - lets find out heroes worse than or equal to Deepak Kumar. Anyone up for this?. You surely have a funny bone in you!!. I also watched this movie last night to find the limits of my strength. And I came very close to accepting defeat. Let me confess i have suffered Mithun movies, Chuck Norris movies and what not.There was a mexican standoff between Deepak Kumar, Vimi and Leela for the worst actor. Deepak kumar won it with fair margin. Atleast the ladies were worth looking at or rather ogling at. With some more screen time the trophy could have gone to Leela . The line at the start proved to be funny "discovery of the year". It should have read "discovery of the time before Krishan Kumar". 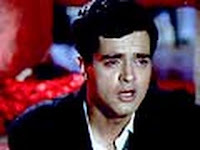 I had heard the songs but when I saw Jinhe hum bhoolna chahe for the first time, I kept wondering who this actor was. Had never seen him before. My first thought was that he must be some relative of the director/producer. That song somehow made me feel that the movie was like Gumrah, storywise. I can usually watch anything for Rehman and Ashok Kumar but this Deepak Kumar is a real putoff. So, even with all my love for the rest of the characters, including Lalita Pawar, Jeevan, Shashikala I dont think I'll ever watch this movie. @Sunheriyaadein: No I guess you can safely give this a miss!! Deepak Kumar will spoil your mood badly. I'd still like to watch this, given a chance. Sometimes, really bad can be fun. Actually, the thought of Vimmi is enough to put me off. She's so dreadful - a block of wood would be more expressive than her. But Deepak Kumar (Rowan Atkinson?! Yikes!) sounds even worse. Thank you for the warning - I'm going to let this pass. @Dustedoff: Block of wood... hahahahahaa.. too funny you are!! He has a strong resemblance to TV actor Rohit Roy. I saw this song - Jinhe hum bhoolna - and was wondering about the hero and was doing some research when I came across your blog. This Deepak Kumar was from some political family and tried his hand in few films like Aabroo(1968),Ladki Pasand Hain (1971-opposite Mumtaz,producer CL Rawal)and finally Khoj(1971-opp. Farida Jalal) and bid the industry goodbye forever. It was a scary film. Scarier than a lot of horror films. And it is the pathetic Deepak Kumar and his brush with total disaster that makes it scary. Poor guy. Does nothing wrong. Not even a single untoward advancement towards Nimmi in her new house. And yet, comes close to being hanged! It made me realize how fragile and finicky life can be. It's so very important to be alert, aware and stay away from the slightest impropriety. The villiany of Darwazalal and the Shashikala character was too horrific for words. At the other extreme you have the extreme virtuousness and goodwill of specimens like Leela Naidu, Ashok Kumar and Rehman. Made for startling contrast. I watched Aabroo for the first time. I really enjoyed, and miss these family dramas so popular in the 60's. Actually, I find Deepak Kumar a very talented and natural actor, and extremely handsome too. He does not have the mannerisms of most of our present self-focussed heroes. I guess his timing to join films was wrong, with stalwarts like Rajendra Kumar, Biswajeet, and Shammi Kapoor about. I would have loved to see him do more films. 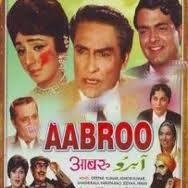 I watched Aabroo, and liked it very much. I miss these family dramas of the 60's. Actually, I found Deepak Kumar to be a very talented actor, and very handsome too! I guess his timing to join films was not quite right, with stalwarts like Rajendra Kumar, Biswajeet & Shammi Kapoor about. I look forward to seeing his other films.